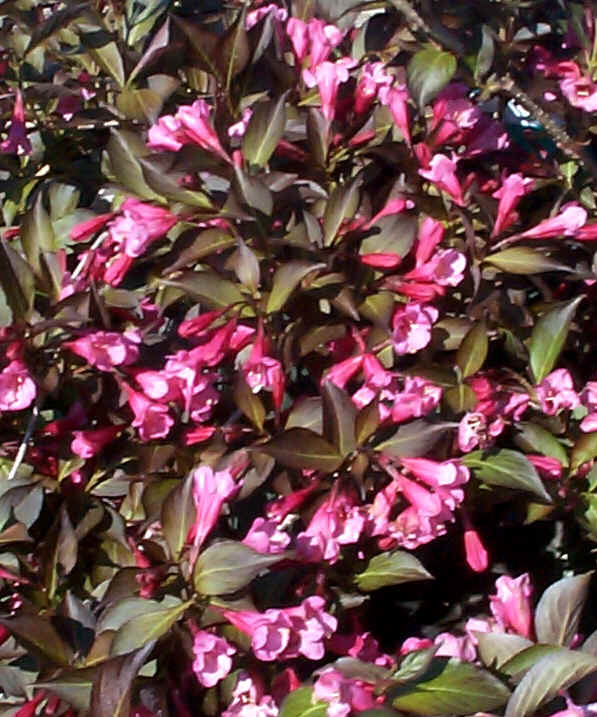 Weigela "Wine and Roses", also known as Weigela "Alexandra". Dark burgundy-purple foliage really show off the rosy-pink flowers, which show in late spring to early summer. Full sun will bring the darkest leaf color. Can attract hummingbirds. Definitely attracts humans. Great planted with perennials and it’s stems and flowers can be used in bouquets. Easy to grow with very few insect or disease problems. Grows to 4-5 feet high and wide. (We are eagerly awaiting the pending arrival of Weigela "Midnight Wine", a minature version of "Wine and Roses". This low mound should fit right into perennial gardens.